Cults like ISIS and Nazis define true human insanity for me. However, the tribal instinct driving this is universal. It pops up in all of us to various degrees. 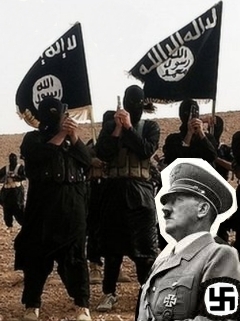 What drives the fanatic ISIS or Nazi to go over the edge? And what is the best way to deal with this? What determines the degree? First, calling acts of insanity ‘evil’ solves nothing; in fact, this only adds fuel to the tribal fire. More effective would be to honestly face just how universal this tribal instinct is. What stands out is not so much this instinct, but how it goes to extremes in the context of civilization. This is ironic in itself; ostensibly, civilization aims to tame instinct. It does do that, but then like a pot on the stove, pressure builds and the pot always blows its top. Civilization doesn’t tame instinct; it either bottles it up, or channels it into sanctioned paths like religion, politics, and sports… and then blows its top. One of religion’s main quests has always been to fix such inherent downsides of civilization — to unite the divided and bring peace on earth and good will toward men. The sentiment here is, unity would come if everyone on earth shared One religion. It fails, as Rodney King witnessed so simply, “Can’t we all just get along?” Ironically, religion turns out to be a primary focal point for tribal division… the very thing is seeks to put right. Viscerally anti-religious folks object to this political upshot of the religious quest, and shortsightedly blame the institution. Focusing on institutional villains, be they religious, corporate, or governmental, vents their emotional tension somewhat. Lacking true power, we compensate with force, and attack the villain that displeases us, yet peace never comes. Long ago, I read a book by Christmas Humphreys, a founder of the London Buddhist Society. I recall how bewildered he felt by the partisanship of Japanese Buddhism sects. Buddha’s message is certainly universal, so he wondered why these Buddhist people ended up so divided, so partisan. Similarly, I doubt Jesus had 50,000 different denominations in mind when he set out to upgrade Judaism. Indeed, Genesis says, “And the Lord said unto Cain, Where is Abel thy brother? And he said, I know not: Am I my brother’s keeper? His had a vision and a message of unity, as he is quoted in John 13:35 “By this shall all men know that ye are my disciples, if ye have love one to another”. As I see it, spiritual rhetoric comes down to being either (1) Of ancients adept in the way, none ever use it to enlighten people, They will use it in order to fool them, or (2) just flat out naïveté. Which applies to Buddha and Jesus? I’m guessing naïveté, especially Jesus. However, followers could have added the naïveté aspect to transcriptions afterward. The ideal of unity and peace on Earth is an appealing one that most everyone supports … until our tribal instinct kicks in. I suspect that we don’t really believe it is in the social nature of humans to form tribes, or if we do, we think we have the power (free will) to control it. Certainly most religions reek of the power to choose and change. We just can’t accept that it is biologically impossible for us to “all just get along” in the same tribe. Institutional attempts to solve this problem are symptoms of our deeper ‘problem’. Dealing with issues at the symptoms level goes nowhere. While we can alleviate the symptoms, cures don’t come about until we grapple with underlying causes. Science employs rational analysis of the natural world to help dig into the deepest causes, and it works. A similar symptoms point of view applied to human nature might help us figure out a more effective way of dealing with our differences… including ISIS! We know from our experience with the Nazis that hoping for peace doesn’t work, as Britain and France did in the 1938 Munich Agreement. We could go whole hog and invade Iraq…. Oh, yes, we already did that. We sure have difficulty finding the right balance; it is either too little too late, or too much too soon. All too often, the reality we ‘understand’ is a shadow of an ideal we want to occur. Isn’t that the opposite of Buddha’s idea of Right Understanding? 1) A Shiite vs. Sunni religious conflict. 2) An authoritian vs. reformer conflict. 3) A secular vs. Islamist conflict. 4) And the question of whether an ‘artificial state’ that stitches together naturally antagonistic tribes can ever form a cooperative unity government, or are they destined to split up as Yugoslavia did? When all is said and done, we’ll end up doing what we feel compelled to do at the time. Our ‘free choice’ in all matters usually boils down to instinctive reactions in response to experience. We just imagine that we are in control. After all, perceived necessity is the mother of all action… and inaction. Instinct drives us. The only offsetting force I know comes from having a broader view to help us ‘choose’ what action appears to be the best reaction. Otherwise, like free-swinging pendulums, we’ll swing from one extreme to the other. Recognizing that tendency is helpful. At least I know the cause of our problem. …Answering to one’s destiny is called the constant. Answering to one’s destiny is a reflective, returning process that deepens throughout one’s life. In light of this, how many old-timers would succumb to the bull- – – – that so readily fires up youngsters to rebel? Instigators would find few willing to fight their wars. Innovators would tempt few to buy their latest and greatest gizmos or cultural ‘cools’. Politicians would find few that took their partisan biases very seriously. Most oldsters would just want to play shuffleboard and sip margaritas. Oh, and they’d let the robots do the work. Bring E.Q. up to speed with I.Q. As I’ve said more than once, we want the benefits of civilization but object to the costs of civilization. We did not evolve to live in such large impersonal populations, but civilization offers us irresistible benefits. We want to have it both ways, as all children do. Another way to look at this is that human E.Q. (emotional ‘intelligence’) is far less developed than human I.Q. We are super clever apes without the necessary ‘wisdom’. We have a superior intellect without the emotional where-with-all to balance that cleverness. E.Q. (emotional ‘intelligence’) can’t be educated into us; it only comes gradually as we stumble through the lessons of life. As the mean age of humanity increases, the mean E.Q. of humanity (wisdom) inevitably and naturally increases. All we need is to reach the point where E.Q. counterbalances I.Q. I imagine E.Q. will counterbalance I.Q. sufficiently within a few hundred years. But hey, even if it takes a few thousand years that’s nothing really. It’s been that long since we’ve been trying to ‘fix’ humanity with our current crop of religions. I suppose we won’t realize this solution will work until it is actually working. Ironically, the pursuit of cures can blind us to the cause of the disease we’re trying to fix. As chapter 65 alludes, the quest for enlightenment fools the seeker, not the ancients adept in the way. 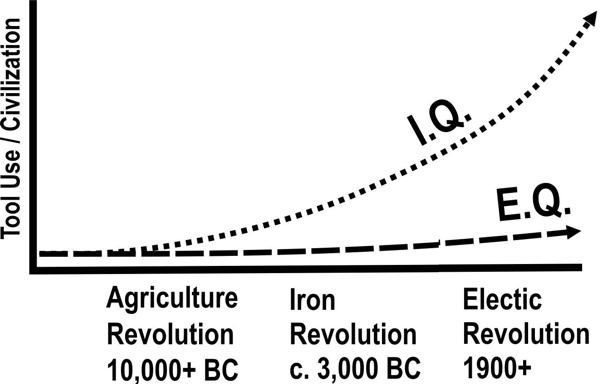 For the past 10,000 years, we’ve been competing over material resources. Over the last few centuries, science has been leveled the playing field. ‘Soon’ everybody will be able to get what they need without war. True, wars also have ideological roots. However, increasing the median age of the population helps reduce the likelihood of any group gaining enough converts to cause serious harm. (1) Among other things, ISIS reminded me of the difference between power and force. This excerpt from the introduction in Tao Te Ching – Word for Word speaks to this difference.